^Ride away offer available on the CBR500R (18YM and older) Price includes GST. Available between 1 April and 30 June 2019. Only at participating Honda Dealers. Overseas models shown, accessories not included and subject to availability. *$500 OFF when purchasing a 2018 or older CB650F and CRF1000R Africa Twin ABS. 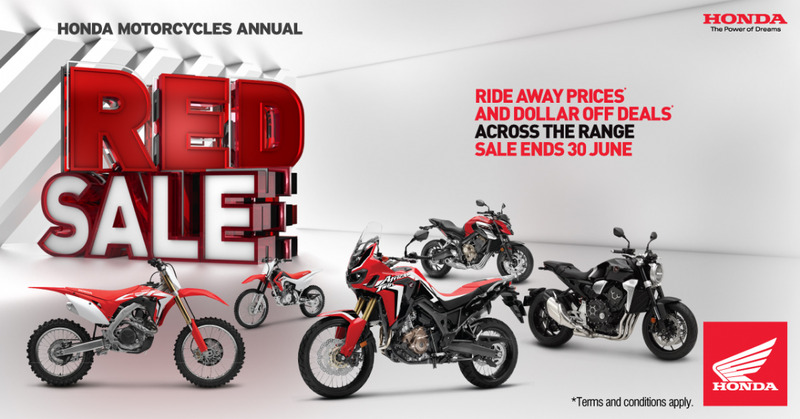 $500 OFF when purchasing a CB1000R, CB300R or CRF250L - All Year models. $300 OFF when purchasing a CRF250LA, All Year models. $1500 OFF the CRF450R 2017 and 2018 Year model only. $1500 OFF the CRF250R 2018 Year model only. $200 OFF the CRF110F, CRF125F and CRF125FB 2018 year models and older.